The Steering Board members of the Peace Implementation Council: Canada, France, Germany, Italy, Japan, Russia, United Kingdom, United States, the Presidency of the European Union, the European Commission, and the Organisation of the Islamic Conference (OIC), which is represented by Turkey. Data that international expert team of the Institute for Research of Genocide, Canada has received from Bosnia and Herzegovina in terms of Census 2013 confirm the earlier findings of the Institute for Research of Genocide, Canada that the Census didn’t follow the proper legislation. 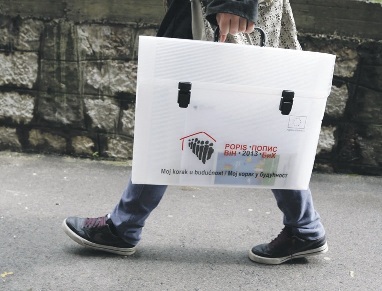 Due to noticeable flaws and violations of the laws and procedures in the way census was conducted has again threatened human rights and freedom of surviving victims and witnesses of aggression and genocide in Bosnia and Herzegovina. Institute for Research of Genocide Canada supports the protests and warnings about irregularities regarding census in the smaller entity of Bosnia and Herzegovina, where the obvious obstruction and manipulation around the rights and freedoms of Bosniaks took place. Be warned that human rights and freedom of Bosniaks in the Census 2013 are seriously disrupted. The census will have the effect of solidifying the results of the aggression and genocide. It is one thing to suggest that the international community's actions are strengthening the division of Bosnia and Herzegovina, which in practice serves the interests of the leadership of the smaller entity of Bosnia and Herzegovina. We emphasize that more than a million citizens of Bosnia and Herzegovina who were expelled from their homeland as a result of aggression and genocide are currently experiencing added crime through Census. Citizens of Bosnia and Herzegovina who were ethnically cleansed and now live all over the world are not being included in the Census as if they are nonexistent. This is again attack on their basic human rights and freedoms. Victims of aggression and genocide are once again being reversed. The new Census results can be of a prelude to a referendum for secession of the smaller entity. The consequences of such results can be a new war and the disintegration of the state of Bosnia and Herzegovina. Bearing in mind the discriminatory provisions of the Census, given the significant gaps in planning, organizing and implementing the 2013 census, given the very large number of irregularities in the process and discriminatory attitude towards the Bosniak, bearing in mind that its results may have negative impact on the sovereignty, territorial integrity and unity of the Bosnian state and society and bearing in mind that this Census is not including hundreds of thousands of citizens of Bosnia and Herzegovina who now live in Diaspora and who have been, as a result of aggression and genocide expelled from their motherland, we question the results of the Census and ask the relevant international institutions to examine inventory process of gathering data in the Census and share their conclusive findings and decisions. We will inform competent American and Canadian institution of violating human rights and freedoms in the Census 2013 process and request their involvement in the protection of the citizens of Bosnia and Herzegovina, whose human rights and freedoms are now threatened. Bearing in mind the multiple discrimination that took place against Bosniaks in the Census, who now has lost its credibility, legality, and fairness, now may become a stumbling block and the focus of a protracted crisis. International expert team of the Institute for researching genocide , Canada, in cooperation with organizations for the protection of human rights and freedoms in North America calls upon the competent organs and institutions of Bosnia and Herzegovina and the international institutions responsible for the implementation of the peace agreement in Bosnia and Herzegovina, not to ignore the warnings of legal and legitimate representatives of the Bosniaks in violation of human rights and freedom of Bosniaks in smaller Entities of Bosnia and Herzegovina. The right to national name and language are fundamental human rights guaranteed in all relevant international conventions on human rights. We expect that the competent authorities and institutions of Bosnia and Herzegovina and the international community will seriously take the voice of protest of the International Expert Team of the Institute for Research of Genocide, Canada and accordingly correct mistakes and make sure that the results of Census becomes authentic and valid.